OK, I’ll admit it… There are certain benefits from having a fiancé living and working in Dubai. Monthly trips to the sunshine is an obvious up-side – especially when the weather is so unpredictable at home – as are the endless shopping opportunities and glamorous nights out in sparkling, gold-plated bars. 1. 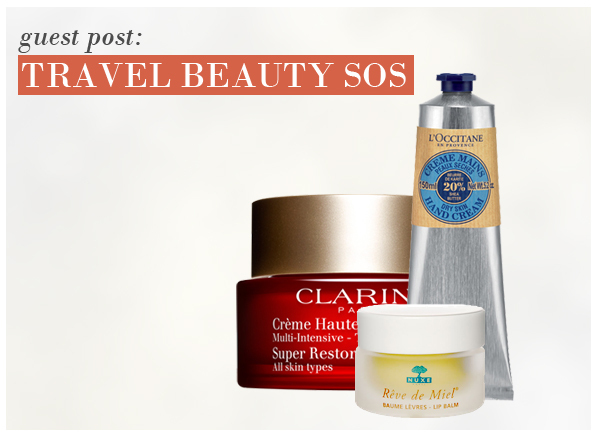 The night before you travel, prepare hair for the moisture-sapping atmosphere with an intensive treatment. Look out for ingredients like ‘Shea Butter’, ‘Almond Oil’ and ‘Honey’, which will leave locks feeling ultra-soft and nourished. My hair tends to suffer from static on flights, so I always pull it into a loose ponytail before take-off and keep a small tube of serum in my hand luggage to comb through before we land. 2. Generously apply an intensive night cream to your complexion just before take-off – even if it’s a day flight. Night creams are packed with ingredients to hydrate, nourish and repair skin over a 7-8 hour period, so work perfectly for long-haul flights. It’s pricey, but if you can afford Clarins Super Restorative Night Wear, £66, I would highly recommend it. 3. Without lip balm, your pout will become dry, flaky and potentially cracked. Nuxe Reve de Miel, £8, is the best lip balm I have ever tried (and I have tried a lot…) At the end of the flight, my pout still feels soft and supple. 4. Don’t forget hands and nails! I keep a small bottle of cuticle oil in my hand luggage and reapply regularly throughout the flight. For hand cream, pick the richest, thickest, best hydrating formula you can lay your mitts on. I never fly anywhere without the travel-sized version of L’Occitanne’s Shea Butter Hand Cream, £6.75. I have used this hand cream for a couple of years and it is great. It has stopped my nails from splitting, which I had a problem with at one time, and I use it every night before going to bed. It is quite a thick cream but is absorbed well. I bought this smaller size as a gift for a friend so that she too can try it out. I highly recommend it. This entry was posted on Monday, July 19th, 2010 at 10:46 am and is filed under Guest bloggers, Hints & Tips, Skincare, Sun and Tanning. You can follow any responses to this entry through the RSS 2.0 feed. You can skip to the end and leave a response. Pinging is currently not allowed. My hair gets oily at roots so I don’t like hair masks. Do you have another idea?